This blog is part of our ongoing how-to series, designed to help you tackle big initiatives and challenges with confidence. To see other blogs in this series, click here. It’s expensive and time consuming to hire someone, so you want to make sure your new hires stick around. Fortunately, there’s a lot you can do to welcome your new employees and give them a successful start to a long, productive career with your company. Consider making the guidelines in this blog part of your new employee checklist. If you don’t already have a new employee checklist, you can use the information below to start building one tailored to your company’s needs. Paycom clients: If you have Document and Task Management, it’s easy to add any of the items below to your new-hire checklist and review completion rates. That way, you can ensure each new employee has a positive, consistent onboarding experience. If you’re not a Paycom client, you can use this post to build your own checklist in a program like Microsoft Word or Excel. Keep in mind that if you take this approach, ensuring the checklist is used and completed for every new employee will be difficult. 1. Send a welcome letter to new employees. 2. Send new-hire forms to new employees before their first day. You may want to send HR documents, like Forms I-9 and W-2, to new hires to complete before they start. This is “preboarding,” and it can be an effective way to help new hires start work earlier on their first day, especially if you have the technology to send and receive these documents quickly and securely. Do note that time spent preboarding must be tracked and compensated. If you’re considering adding this step to your new-hire checklist, it’s critical you have processes in place – or the right technology – to ensure the confidential and timely exchange of new hire documents. Additionally, new hires should have a way to track the time they spend preboarding accurately. 3. Block out time for a meet and greet. Once new hires are on site, make them feel like valued members of the team. Have an employee greet new team members at the entrance on their first day. Help them connect with other new hires through introductions or even a group orientation, depending on the size of your organization. 4. Ask managers to assign tasks. Make sure your managers offer their new hires’ practical, manageable assignments that can be completed on their first day. That allows them to start feeling like contributing team members sooner. Managers also should have a 30-, 60- and 90-day plan prepared for their new team members, so they know what’s expected of them and what success looks like in their new role. How did everything go today? Is there anything you have any worries or concerns about? Any concerns for the future? Is the job/team/company what you expected? Do you have enough, too much or too little time to do your work? What’s been going well? What are the highlights of your experiences so far? Why? How do you see your job relating to the organization’s mission? What’s the biggest difference between what you thought the job was like and what it’s really like? Is there anything about your role, the team or company that is still unclear? 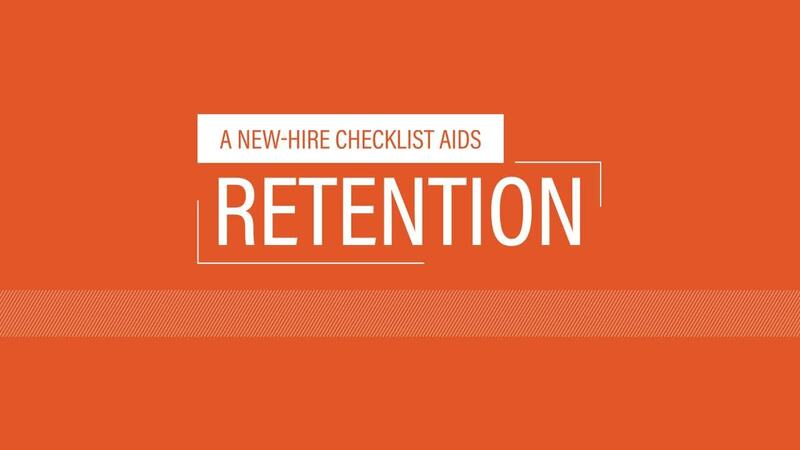 While these check-ins aren’t technically a part of the new-hire checklist, they are a crucial part of increasing employee retention and engagement, during the time new hires might still be on the fence about staying with your company. 5. Show new hires around their new space. Check that any software required for the new employee’s job is already installed, and consider placing a directory or list of employees and extension numbers near their phone. One way to make new employees feel especially welcome is to include a welcome gift with company-branded items, new supplies, snacks or even small gifts that help new hires get familiar with your company culture. 6. Help new employees connect to their team. Send a new-employee introduction announcement to the rest of the company or department before a new hire begins. Share details about their experience, new role and personal information if it fits with your company culture. But don’t limit the introduction to email. Follow up in person by introducing the new hire to their team. Take time to mention the new person’s strengths and what he or she will bring to the company. Give the new hire guidance on who he or she can ask for help regarding specific issues. 7. Help your new hire get acclimated to the company culture. Because culture is the unwritten code that influences the way the team, department and company makes decisions large and small, giving new hires a quick cultural overview can help them feel more confident sooner. Plan a group activity, or encourage your new hire’s manager to do so. A team lunch, coffee break or happy hour can provide valuable time for informal connection with new co-workers. Consider assigning a “buddy” or having the new person shadow a more experienced employee. If your new hire is shadowing someone, give that employee advance notice. This will allow him or her time to prepare the day’s tasks based on what the new hire will need to learn. Talk to new hires about how their work matters to the organization. This helps give them a sense of purpose as they start their new job. If possible, have others in the same position share stories of success or the business impact they’ve seen in their roles. Depending on your company, you or the new hire’s manager may do this. Either way, helping your new hire make this connection can help them feel like an important part of the team from the beginning. Following these guidelines when you create your new-hire checklist – or adding them to your existing checklist – can help ensure new hires experience a first day that makes them excited to work for your company for the long haul. To learn more about Paycom’s Documents and Checklists software, request a demo. DISCLAIMER: The information provided in this blog is for general informational purposes only. Accordingly, Paycom and the writer of the above content do not warrant the completeness or accuracy of the above information. It does not constitute the provision of legal advice, tax advice, accounting services, or professional consulting. The information provided herein should not be used as a substitute for consultation with professional tax, accounting, legal or other professional services. As a communications specialist at Paycom, Lauren Rogers keeps employees abreast of company news and events, and provides insight to industry leaders regarding issues affecting human capital management. With experience in marketing and communications, Lauren has written blogs and other materials for a variety of businesses and nonprofits. Outside the office, she enjoys gardening, testing new recipes and sipping something caffeinated with her nose in a book.